Most radio historians asert that radio broadcasting began in 1920 with the historic broadcast of KDKA. Few people actually heard the voices and music which were produced because of the dearth of radio receivers at that time. The public, however, was overcome by a radio craze after the initial broadcast. Radio became a product of the mass market. Manufacturers were overwhelmed by the demand for receivers, as customers stood in line to complete order forms for radios after dealers had sold out. Between 1923 and 1930, 60 percent of American families purchased radios. Families gathered around their radios for night-time entertainment. As radio ownership increased, so did the number of radio stations. In 1920, KDKA was not actually the only operating radio station, but it remains a benchmark in most accounts. And by 1922, 600 radio stations had sprung up around the United States. Chicago's first radio station, KYW, begun in 1921 by Westinghouse Electric and Manufacturing Company, was the first specialized radio station, broadcasting exclusively opera six days a week. 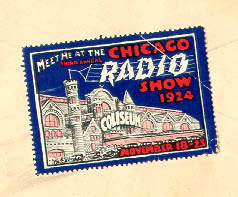 The radio station experienced immediate popularity and continued to be a favorite in Chicago. After the opera season ended, the station owners saw the need to diversify their programming. They began broadcasting things like popular music, classical music, sporting events, lectures, fictional stories, newscasts, weather reports, market updates, and political commentary. Radio stations like KYW enhanced a sense of community among different ethnic groups as each group could listen to programming suited to their interests and needs. However, the advance of radio technology also created a tension between modernity and the traditions and habits of Americans. The rapid spread of radio listeners and programs lead to inevitable confusion and disruption. Radio waves were up for grabs, as stations competed with one another for time and listeners. Many programs overlapped. Listeners of one program were frequently interrupted by overlapping programs. In addition, the public, the government, and emerging radio corporations viewed radio as a means of public service, rarely as a vehicle for personal profit. Radio manufacturers alone experienced financial gain from the radio boom. Radio announcers, deejays, and stations worked on a non-profit basis. Advertising was not introduced until later in the 1920s, changing the public service face of radio, to one of private gain. The federal government hesitated to regulate the airwaves. Radio stations, listeners, and emerging broadcasting corporations all asked the government for some sort of intervention to end the free-for-all that radio had become. The government responded slowly, gradually passing laws to govern the radio. The Federal Radio Commission was set up in 1926; the Radio Act of 1927 organized the Federal Radio Commission. This Act became the basis for the Communications Act passed after the rise of television. As the government spent more time investigating radio stations, apportioning time to different groups and programs, and monitoring the growth of the radio industry, they became more and more comfortable with the responsibilities of regulation. These federal bodies eventually ceased to doubt their right to regulate. Crystal radios, like the one at left, were among the first radios to be used and manufactured. These radios used a piece of lead galena crystal and a cat whisker to find the radio signal. Crystal radios allowed many people to join the radio craze in the 1920s because they were easy to make from home. xMany boys' magazines encouraged young boys to make their own radios, and included step-by-step instructions for the crystal radio. All necessary supplies could be purchased for as little as six dollars. However, the sound in the earphones was very weak and often interrupted by static. Early radio's, including crystal radios, needed antennas to operate well. The most frequently used antenna was the inverted L. For more information on this and other antenna, click HERE. While manufacturers tried to improve the crystal radio, one inventive young man, Edwin Armstrong, worked at improving the radio all together. He worked to implement the De Forest Audion tube into the radio. This was also known as a vacuum tube. Eventually, vacuum tubes replaced the crystal. Armstrong's first model of a radio using vacuum tubes was called the Radiola Superheterodyne. After companies succeeded in finding an inexpensive method of producing these tubes, they introduced a vacuum tube radio to the market in 1924. Sounds came through more clearly even over great distances. The additional innovation of the transistor allowed radios to become small and portable. This radio, using a 250 watt spark transmitter, was built by Moe Smith VE1XG. Smith's innovation paved the way for radio manufacturers Pilot, Federal, Patterson, and more. It was one of the first radios to use peanut tubes but was incredibly loud to use. For more information on peanut tubes and radio technology in Canada, click HERE. Overwhelming volume was a consistent problem with early radio. Even after the antenna was used to decrease radio static, listeners were still often "blasted" by noise when they switched stations; the switch from a distant frequency to a nearby station resulted in a dramatic increase in volume. The invention of the automatic loudspeaker in 1928 improved this problem immensely. This is a Roger's Batteryless Receiver Model 130, built in 1925. It is typical of radios in the twenties in that it is battery operated and has three dials and five identical tubes. The move to battery powered radios resulted in an enormous upsurge in public popularity of the radio. Radios could more easily be incorporated into the decor of private homes. It furthered the mass consumption of the radio, producing new demands for this technology. This radio is very similar to the Stewart Warner 300, of 1925, seen below. This radio is crafted in the cathedral style. Other radios were made in the tombstone style or in the crystal radio style, shown before. Radios were made in either plastic, wood, or metal. For further examples of each, click HERE. Are you interested in buying, selling, collecting, or just browsing for other early radios? Click HERE. Radio Advertisements of the 1920s ; For more ads of radios in the 1920s, click HERE. To return to the Main Page of the Chicago Radio Show, click HERE.